The experienced management and staff of MVLS will be able to meet your particular needs with the highest level of creativity and service. We work closely with our clients from the inception of each project to assure its ultimate success. MVLS is expert in creating unique, legal license plate programs from concept to manufacture and fullfilment. Custom made decals with our unique security features are available to compliment your licensing programs. 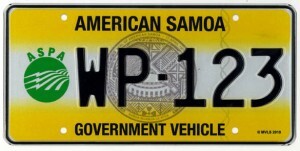 These beautifully designed plates, issued in pairs, may be custom ordered with up to five characters.